A wonderfully made film! 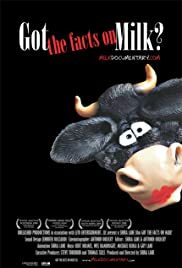 This is a must-see, mind-blowing documentary for is for anyone who drinks milk or has family/friends that consume dairy. This documentary utilizes multiple sources of information including the dairy industry, the United States Department of Agriculture, farmers, and just regular people. It is rare however to get another side of the story. We are all so inundated, basically from birth, with advertising that dairy is so healthy for us, apparently so healthy that it is even SHOCKING if someone says they don't drink it. "What?? Where do you get your calcium?" Especially when we are young, it's like we're required to drink dairy. But is dairy really that healthy for us? This is an incredibly important question to ask, since dairy is in so many foods. This knowledge-imparting film is presented in a fun way. It entertainment that can make a difference in your life. **If this film is not yet available in your area feel free to contact your local independent or other cinemas. There are many great lines in the film worthy of quotation, but I won't get into that here. Ering a notepad and a friend to the theatre!